Here you can preview rhythm tracks and select one for your next composition. Tap on a rhythm track to select it. The application will load the default tempo (BPM or Beats Per Minute) associated with the new rhythm track. 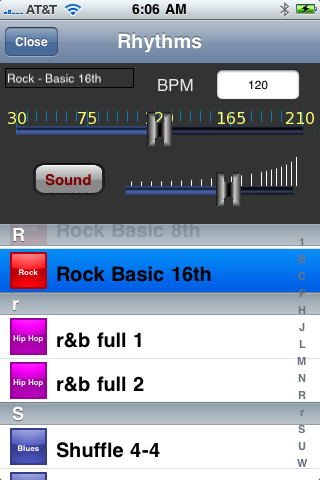 Once you've selected a track, use the BPM slider or the text entry field to enter the tempo in Beats Per Minute. The metronome is pretty accurate over time and allows text entry of microsecond accuracy. Only the last 3 decimals are displayed after you enter the value, but the application remembers what you entered. If you have already laid down some tracks you should be carefull when selecting a new rhythm track because your original tempo setting will be lost. You should write it down so that you can reenter it once you've selected a new track. I bet your thinking the same thing that I'm thinking - there should be a 'lock' option to prevent overwrite of the tempo setting when there are existing tracks. The fader control adjusts the output gain of the rhythm track. This control mirrors the rhythm track fader on the main view. The Sound button will mute the rhythm track when played from the main view.